Standard blank shipping labels. Works for PayPal, Endicia,Stamps.com and any other postage software. 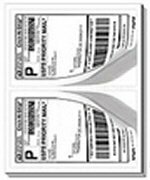 Laser jet and inkjet labels. 4" x 6" thermal direct labels.